Just out from Savage Arms is their new Model 220F bolt action rifled slug gun in 20 gauge. For starters, lets get the basic specifications out of the way. Features AccuTrigger, Blued barreled action, free-floating and button-rifled barrel, detachable box magazine, controlled round feed bolt with oversized bolt handle, and swivel studs. I've got quite a bit to say about slug guns, to be sure. Back when I was growing up, a slug-shooting shotgun was considered the lowest form of deer hunting firearm imaginable. For the most part, it was. Popping a deer with a foster slug through a smoothbore, shooting off the bead was about as a sophisticated approach as using a musket. Rudyard Kipling waxed poetic about the "Brown Bess" genre of musket that was in use from the late 1700s through the end of the Napoleonic Wars in the early 1800s. In the 1790s, the lighter "India Pattern Short Land Musket" appeared with a 9 lb. weight, a realistic rate of fire of two to three rounds per minute, and an estimated misfire rate of 20-40%. Much of the language in common use today (skin-flint, flash in the pan, and going off half-cocked) spawned from the smoothbore musket. The India pattern production was over 3,000,000 units, some still in use by the British as late as the 1850s. Sticking a rifled barrel into a shotgun hardly turned them into rifles. We still had shotgun triggers, problematic scope mounting, slow lock-times, and two-piece stocks-- all things to avoid if you want accuracy. Invariably, these rifle wanna-be's were just unsatisfactory deer hunting weapons. I went through the gamut of B-80's with rifle sights, Marlin "Goose Guns" turned into slug guns (the 512 Slugmaster), and various other shotgun / rifle abortions. Most all were 12 gauge, heavy-handling pigs, still kicked my teeth in, and gave forgettable accuracy. There was one, and only one slug gun I tested in all those years that shot like a rifle. That was the poor-selling Browning A-Bolt, a slug gun that was spectacularly better than the rest by no small margin. The A-bolt was "introduced" in 1994, but didn't make it out until a couple of years later. The problem was, as good as the A-Bolt was (and is) Browning priced it at $800 back in 1996, while the other slug guns of the day were less than half that price level. It sold like snow-cones in Anchorage, and was quickly discontinued. Hindsight is a wonderful thing, though, and the A-Bolt currently commands nose-bleed prices in the used market. My best accuracy was with Winchester-BRI 2-3/4 slugs back then, and my example did shoot 1-1/2 inch groups at 100 yards, far better than the 3-5 inch levels the other slug guns could manage. The ballistics were still relatively weak, though, the gun was still both heavy and uncomfortable to shoot for extended periods, but it was accurate, was built like a real rifle, had a real trigger, and ultimately was a terrific commercial failure. The Savage 110 rifle itself was designed by Savage gun-designer Nicholas L. Brewer in 1956, and entered production in 1958. Right now, the Savage 110 ranks as the longest-running American made bolt-action rifle produced today. With its over fifty years of continuous production, it has long ago surpassed the Winchester Model 70 in longevity and the accuracy of this action is now legendary. Savage has just obsoleted every other mass-produced slug-gun ever made with their Model 220F-- by no small margin. It isn't built on an abortion of a shotgun platform at all, the Model 220F is built on the famous 110 Savage bolt action with dual pillar bedding, a perfectly floated barrel, and the Savage Accu-Trigger. It is built like a real rifle, and it shows. Another writer recently commented, "Yeah, a six-inch group is probably the best you can do at a hundred yards from the bench on a real good day with a slug gun." In times past, unfortunately that type of "performance" was more often true than not, with far too many folks struggling to get four-inch groups at 50 yards. Those days are gone as of right now. The Savage 220F weighs just as stated: 6 pounds, 12 ounces, and its AccuTrigger breaks at 3 lbs., four ounces right out of the box. It also features the Savage "P.A.D." recoil pad that impressed me so very much on two previous Savage rifles, their basic black / blued tack-driving .22-250 and the also tack-driving Cabela's 10ML-BP that I recently used to ruin a 6.5 foot Minnesota black bear's evening. It also has the three-position, quiet, ambidextrous Savage safety than puts noisy cross-bolt shotgun safeties to shame, and lacks the nasty click or pulling back an exposed hammer as you find on hinge-pin hammer guns. Certainly, all guns are individuals, but Savage R & D has done enough extensive testing with this rifle to be able to offer up some solid suggestions. In fact, the hang-tag on the 220F's Accutrigger suggests three loads: the Federal Premium Barnes Tipped three inch 1900 fps round, #PT209XT1 or either of the pair of Remington AccuTip offerings: the PRA20 1850 fps 2-3/4 inch or the PRA20M 3 inch 1900 fps loads. The Federal / Barnes load is 5/8 oz. (273 grains) while the Remington loads are listed at 260 grains. All of this should be starting to get your attention; it sure snagged mine. The 100-yard test target that accompanied this gun was a three-shot group measuring less than three quarters of an inch, .70 inch center to center to be exact (see above). This is an astonishing level of accuracy, if not breathtaking, from a factory slug gun. It was fired with Remington three-inch AccuTips. The Federal PT209XT1 load, featuring the tipped Barnes MZ-Expander, has a static 100 yard BC of .19. Based on Federal published data, it gives a 6 inch kill zone maximum range of 176 yards with no hold-over, a center of the body hold out of the Savage 220F. No experienced pistol hunter would question the ability of a .44 RemMag out of a 6-1/2 in. barreled revolver to quickly take any deer at 50 yards, though it has been shown as effective on much larger, tough game. Yet, this Federal Premium load retains more velocity and energy at 250 yards than a high-performance .44RemMag load (Remington #RH44MGA, 275 grain JHP Core-Lokt) has at 50 yards. Even applying the restrictions as set forth by Jack O'Connor, it seems that, from a practical perspective, Savage Arms has just introduced the world's first popularly-priced production 200 yard slug gun with far more intrinsic accuracy than required for deer at moderate ranges. My understanding is the original Savage 110 action was the long action, introduced in a short-action version just a year after it originally appeared. Though numerous improvements and refinements have been applied to the 110 system over the years, one comment made long ago directly applies today to this new slug gun. "The Model 110 is a true featherweight rifle with clean, symmetrical lines and excellent proportions. Its handling qualities are good; the balance of the piece lies between the hands where it belongs." So wrote M.D. Waite in his February, 1958 review of the then-new Savage 110. The Model 220F is based on the Savage long-action. A few folks don't bother considering what scope is appropriate for a given rifle, just buying a scope without ever checking the mounting dimensions of the scope or the rifle-- then are "surprised" when things don't fit as they should. For this rifle, you might wish to consider a full-length scope with a main tube of six inches or more in length. I selected a Bushnell Elite 3200 3-9 x 40mm that has a six inch main tube, mounting it with a pair of Warne Maxima medium height rings. It worked like a charm, offering plenty of clearance between the 220F's oversized bolt handle and also generous clearance for scope covers or pop-out caps. 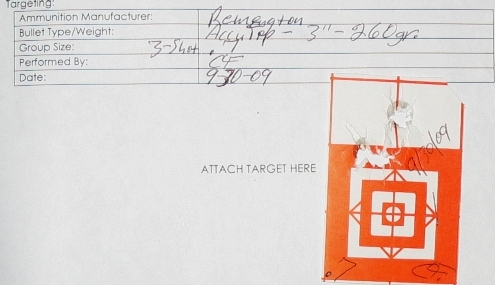 It is Bushnell #32-3944B, the "B" meaning ballistic reticle. This one has an etched-glass ballistic reticle that actually makes sense, with three inches between the hash marks at 100 yards. With that, it was off to the field to see what the Savage 220F would actually do. The range conditions were far from ideal, with 12-21 mph gusty winds. Paper published ballistics are rarely accurate, though, and this Federal load was no exception. After a few initial targeting shots, I ran several of the Federal PT209XT1 loads through the chronograph. As it turns out, the 1900 fps velocity published by Federal was wishful thinking according to my chronographs. Its 5 foot muzzle velocity ranged from 1725 to 1800 fps, with an average velocity of 1752 fps. That changes things a bit. The six inch kill through the body hold range of this load in this individual rifle with the Federal ammo is about 163 yards, not the 176 yards you might assume from the Federal data. I did a little further checking, and discovered that Federal is not at all alone is this regard. I'm advised that the standard test barrels for 20 gauge slugs are 30 inch barrels, although I am not aware of any common 20 gauge slug guns with barrels nearly that long, with 22 - 24 inches being the most common. You can expect significantly lower velocities from the stated MV of any of the most recent "high performance" 20 gauge slug loads. Only a chrono with a specific load will tell you for sure, but an average of 150 fps less muzzle velocity from the ammunition manufacturer's published velocities is a reasonable guess. I didn't get quite the accuracy of the Savage factory target, but I was shooting in gusty wind with a different shell than the Remington AccuTips Savage used. Still, the accuracy was far more than required to cleanly take a whitetail out to 200 yards. With the Federal / Barnes loads, the Savage 220F grouped consistently inside 1-1/2 inches at 100 yards, right at two inches at 150 yards, and around 3-1/2 inches at 200 yards. Federal claims that this "Barnes Expander Tipped Load" is capable of 4 inch groups at 200 yards in their ad-copy. Personally, I'm not sure how a broad accuracy claim such as this could be made, as the individual rifle has a lot to do with it. Nevertheless, in this Savage 220F Federal Premium more than delivered on this promise to the credit of Federal, perhaps more so to Savage Arms. Here's how the tested set-up actually breaks down: Targeted three inches high at 80 yards (or 2.69 inches high at 100 yards), it is center of the body hold out to 163 yards. From 165 yards to 190 yards, using the first hash mark you are good to go with the same center of body hold-- it's that simple. Naturally you'll need to confirm things in your individual rifle, and adapt to ambient conditions (wind) as necessary out in the field. Under ideal conditions, it means Savage has just put in your hands a spectacularly good 200 yard deer rifle disguised as a slug gun. To show you what a tremendous advance this is in factory slug gun performance, consider the 1 oz. sabots that shot well for me in the old Browning A-Bolt 12 gauge. Those were 1350 fps loads and despite the harsh recoil they were no better than 110 - 120 yard deer loads. This 20 gauge load out of the Savage, corrected for observed velocity, retains more velocity at 380 yards than the old Winchester / BRI 12 gauge load had at 125 yards. On every single shot I fired at 100, 150, and 200 yards the result would have been a quickly dead deer. The Savage 220F is light, superb-handling, and the Savage "P.A.D." pad did its job-- I found it very, very comfortable to shoot. Right out of the box with just a quick sight-in, this is an easy-shooting center of body hold 165 yard deer rifle at a bargain price, running right at $450 or so street price as this is written. There is nothing on the market that I know of that comes close to the Savage 220F as a practical deer rifle based on its excellent balance and handling, outstanding trigger, soft recoil, and excellent accuracy. This is based on the Federal Barnes Tipped Expander load, testing the gun under less than ideal range conditions to boot. More ammunition is on the way, and I'm confident that the accuracy I had can be substantially bettered. 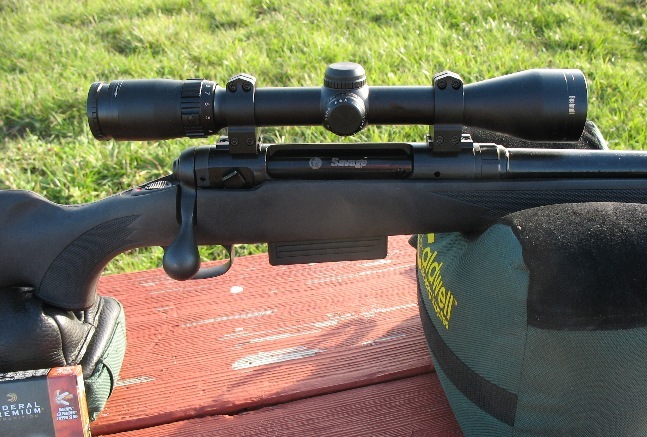 Savage already has demonstrated that Remington AccuTips can produce sub-3/4 MOA 100 yard groups with this rifle. This is a home run for Savage Arms with little question. It obsoletes both the 12 gauge slug gun and all shotgun platform pseudo rifles in one fell swoop in a smooth handling, soft-shooting platform that is easy to carry and has more accuracy than can be used at typical white-tail hunting ranges. And, it just happens to be a screaming bargain as well.